Born in Caracas, Venezuela. Raised in Puerto Rico and Miami. Surrounded by Spanish cuisine at home where his grandparents cooked traditional homemade dishes daily. Discovered his passion for food and cooking at age 6. A young Sucre at age 11 determined to become a Chef, would cook meals from scratch every afternoon after school, to share with his sister. Self-motivated Young Entrepreneur, from humble beginnings. Athlete at heart, Professional and Executive Chef by nature and passion. Obtained his Bachelor’s Degree in Culinary Arts in Miami, studied at Johnson and Wales and consecutively attended Le Cordon Bleu. Experienced an intensive program at Institute Paul Bocuse Château du Vivier, in Lyon, France. Very early in his career, while still expanding his culinary knowledge Chef Sucre worked at Cacao Restaurant in Miami, under Chef Edgar Leal. Learning, while perfecting his professional technique surrounded by a Latin Infused Cuisine like no other, experience which opened a broad road of opportunities and visions for Sucre. Owner of The Chef’s Hat Catering in Miami, performed in various private events locally, and overseas. 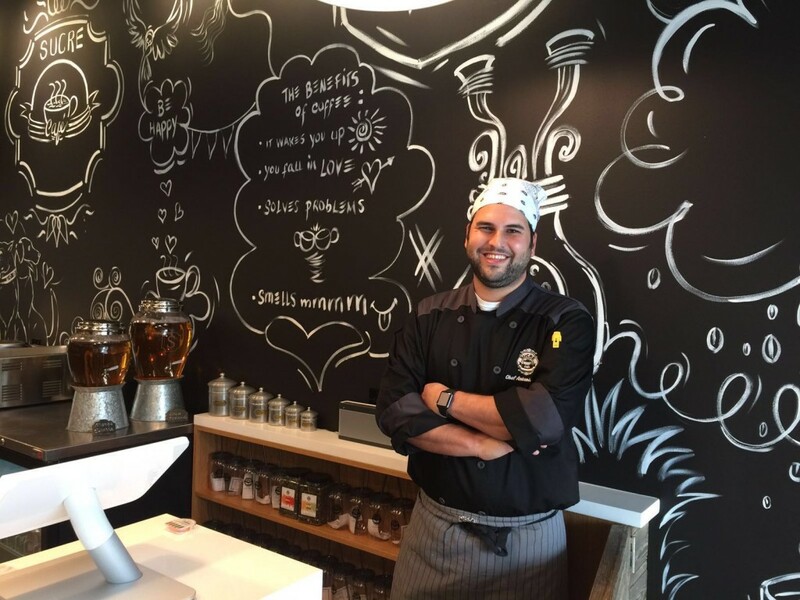 Chef Sucre worked at Vialetto Restaurant (2007) known locally for its exemplary Italian Cuisine infused with Latin Caribbean flavors. Intrigued by different food cultures Sucre became part of the opening team for Domma Polo Bistro (2011), Restaurant and Lounge located in Downtown Miami. Helped develop and execute its Argentinian menu, influenced with Mediterranean and Latin American Cuisine. Joined the growing and locally known Passion Restaurant Group team (2012) working for two of the Corporate locations in Miami as an Executive Chef, Crazy About You and Love Is Blind. Today, Chef Sucre latest project is Sucre Café (2015), French Bistro and Coffee Shop, a hole in the wall which many call “a hidden hem”. Located in Coral Gables Downtown, next to the historic City Hall. Sucre Cafe reflects Sucre’s passion for cooking through homemade recipes, elaborated breakfast, handcrafted sandwiches, French baked goods, small entrees and more. His cuisine is influenced strongly by his Latin birth heritage, with a clean technique and inclination towards Italian and French Cuisine, Chef Sucre gives to his cooking a modern touch while infusing it with all his Latin flavors. Chef Sucre’s many accomplishments and hard work have shaped who is as a professional and as a result who he has become today.